University of Ottawa Law Professor, Michael Geist, continues to dig up details on the origins of the Bell coalition website blocking plan, this time noting how details were first presented to the CRTC in private, closed door meetings. According to emails and documents obtained under the Access to Information Act, Bell first presented its ideas for FairPlay Canada to the CRTC–months before a public consultation process began. Dating back to July 2017, Bell executives sought meetings with CRTC commissioner Christoper Macdonald to present their website blocking plan. 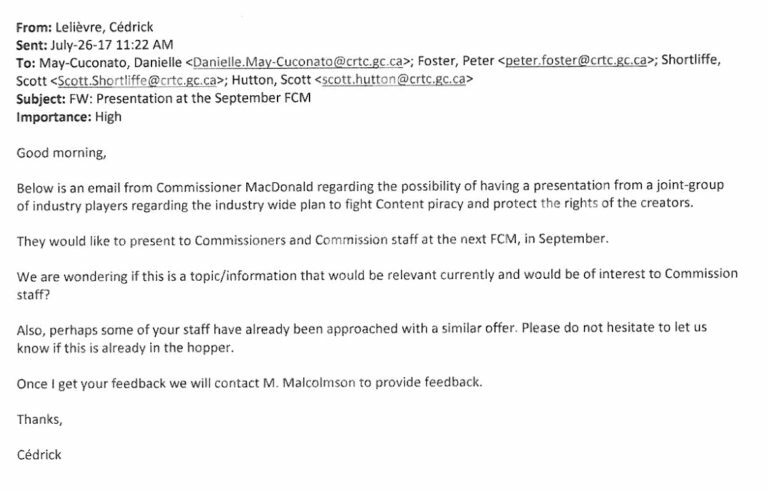 Emails show Macdonald followed up a call by hinting Bell could present its ideas to the full commission—without a public filing first. This presentation by Bell happened on September 21, 2017, which according to Geist, was one day after the company recommended to the House of Commons site blocking be added to NAFTA. In December 2017, the website blocking plan was leaked to Canadaland, and one day after, the CRTC’s Senior General Counsel, Stephen Millington, requested a copy of the commission’s internal legal opinion on website blocking of piracy websites. The meetings raise serious fairness concerns regarding the regulatory process on website blocking. By granting Bell a private audience with CRTC commissioners and officials, the company was able present its case without counter-arguments or a public airing. In fact, without a transcript of the meeting, there will be questions about whether the ultimate CRTC decision may have been influenced by evidence presented outside the formal hearing process. Last week, the House of Commons Standing Committee on Access to Information, Privacy and Ethics, released its report on net neutrality in Canada, and concluded the Bell coalition plan to block websites should be rejected.